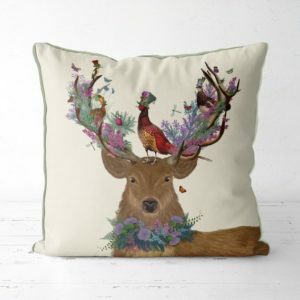 Decorative pillows can go a long way in tying a room’s interior decor together, and at Katzberry, we have the perfect selection for you. 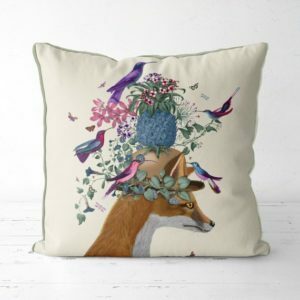 Browse our collection of fun and modern pillows for your bedroom, family room, living room, office, or guest room. 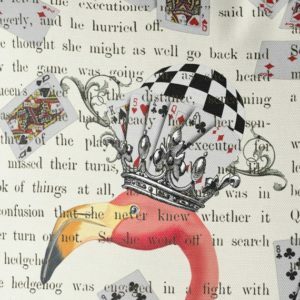 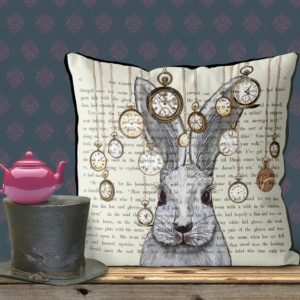 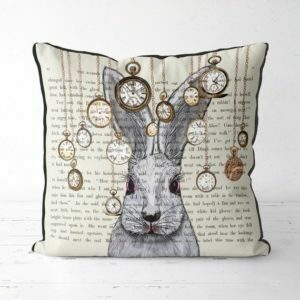 We offer themed pillows, such as our Alice In Wonderland Cheshire Cat Pillow and our Christmas Deer & Snowman Pillow. 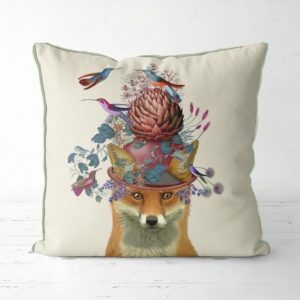 Once you find the right pillows for your home, be sure to browse our array of other home accessories, such as decorative mirrors and throw blankets. 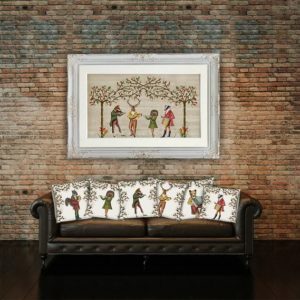 If you have any questions about our distinctive home decor, contact our team today. 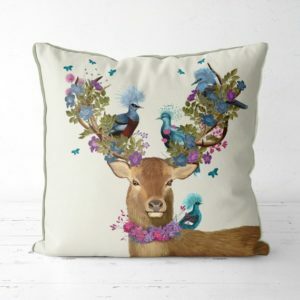 From the Birdkeepers Collection this Deer is enjoying his Blue Pigeon ensemble of friends. 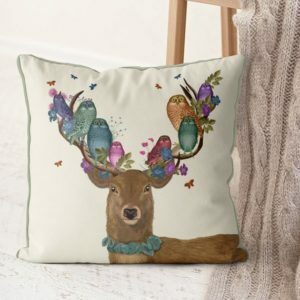 From the Birdkeepers Collection this pillow features a Deer with many colorful Owl friends as well as little butterflies flittering around. 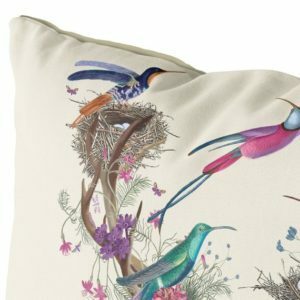 From the Birdkeepers Collection this beautiful pillow features tropical birds playing around in and out of bird cages for a circus of activity. 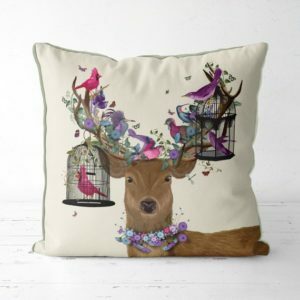 From the Birdkeepers Collection this beautiful pillow features tropical birds flying around their strategic nests as the deer has a matching floral neck adornment. 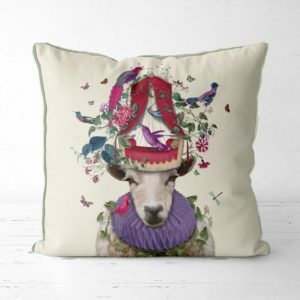 From the Birdkeepers Collection this beautiful pillow features a very fancy sheep dressed in her finest and comes along with her exotic bird friends making home in her hat. 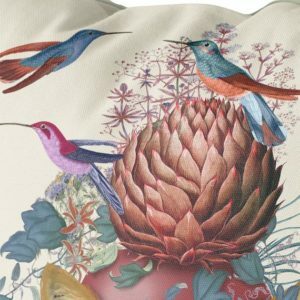 From the Birdkeepers Collection this beautiful pillow features a quite patient fox, while whimsical flowers abound and tropical birds fly around the centered pink artichoke. 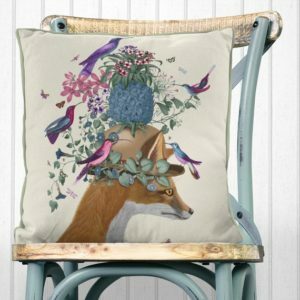 From the Birdkeepers Collection this beautiful pillow features a lovely blue pineapple amongst exotic birds nesting around a flower infiltrated hat. 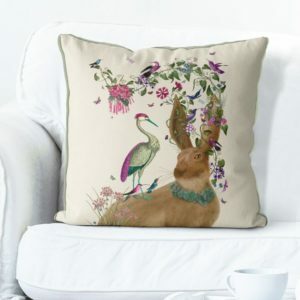 From the Birdkeepers Collection this beautiful pillow features a Hare and a friendly Heron design with florals and other exotic birds flying around. 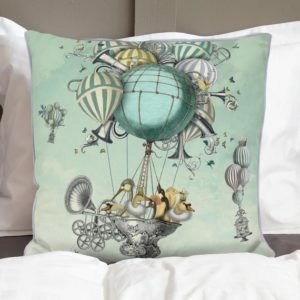 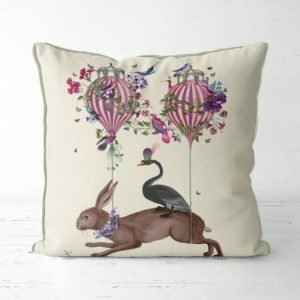 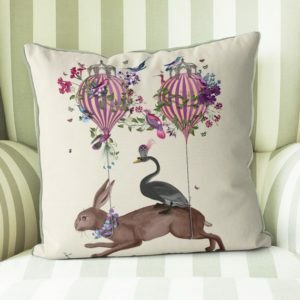 From the Birdkeepers Collection this beautiful pillow features a Hare and exotic bird friends soaring along with hot air balloons. 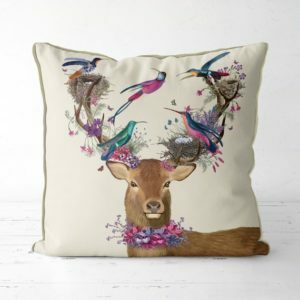 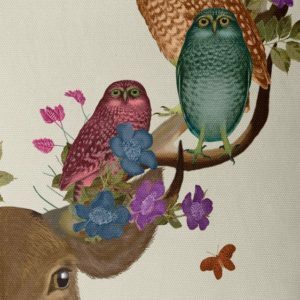 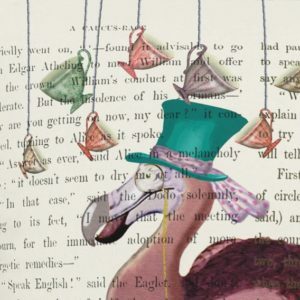 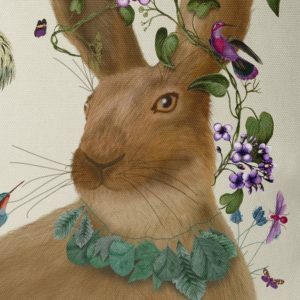 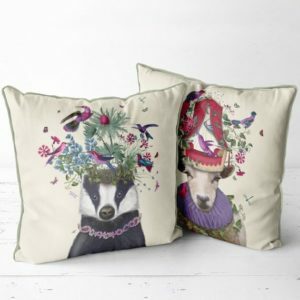 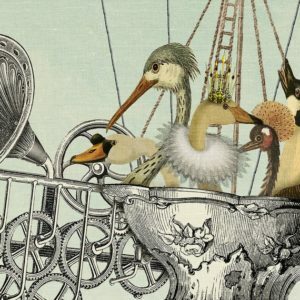 From the Birdkeepers Collection this beautiful collection features a range of country animals adorned with fantastical headwear and exotic birds of all colours and will bring a splash of bright colour and warm summer tones into your room. 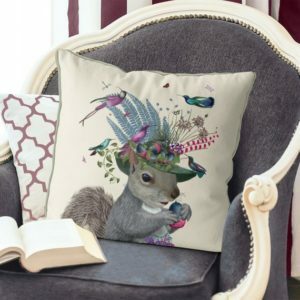 From the Birdkeepers Collection this beautiful pillow features a hungry little squirrel with exotic birds peering through his fancy hat while he contemplates his blue acorn. 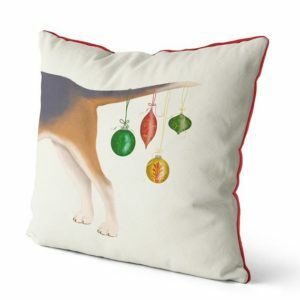 A really unusual gift for a dog lover at Christmas, and a must have decoration for a house of dog owners. 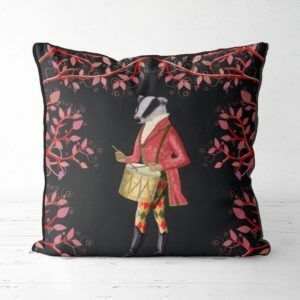 Printed on a cream back and red piping all around. 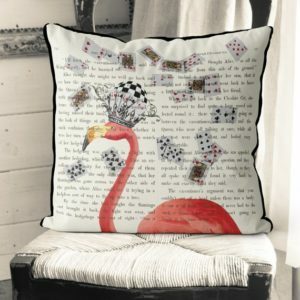 Printed on a cream back and red piping all around. 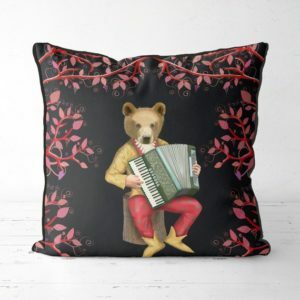 A bear for Christmas, in the snow! 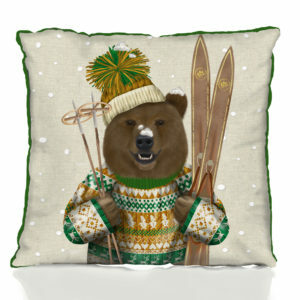 This guy is wearing a lovely Christmas sweater, a big smile and stocking hat and he is ready to go skiing. 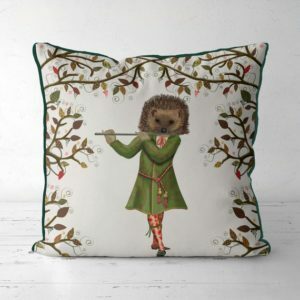 He has a very light dusting of snow on his nose. 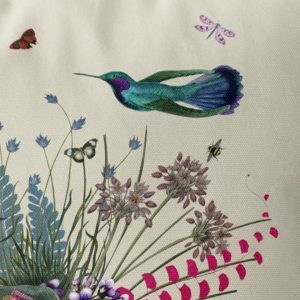 Printed on a cream back and green piping all around. 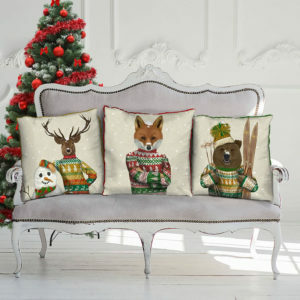 He is one from a set of three matching pillow covers of animals in Christmas Sweaters. 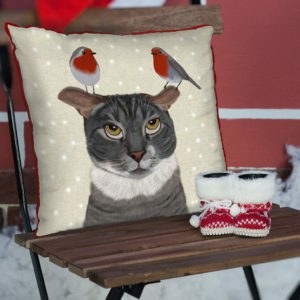 This grey cat appears to be contemplating whether to be naughty or nice. 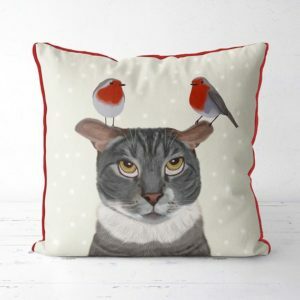 With friendly robins balanced on his ears while the snow falls gently in the background who can resist new friends! 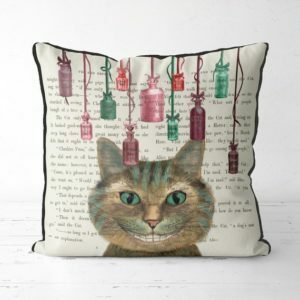 A great Christmas gift for a cat lover. 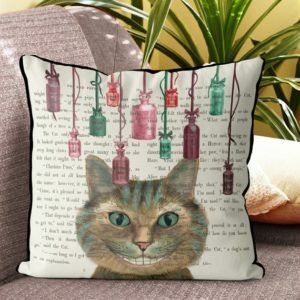 Or maybe a gift for your cat even! 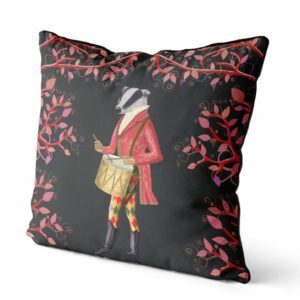 Printed on cream back with red piping all around. 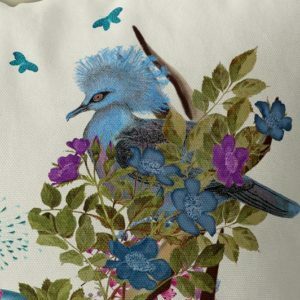 May be the Ugly Sweater contest or maybe this guy is wearing a lovely Christmas sweater! 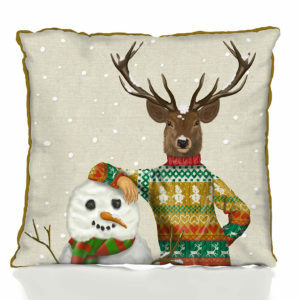 In either case has obviously just finished building a snowman that he is leaning on. 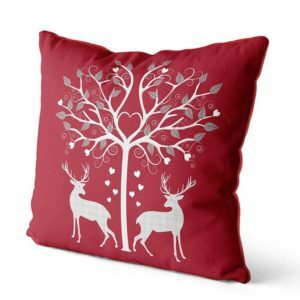 He has a very light dusting of snow on his nose and antlers and has snow gently drifting around him. 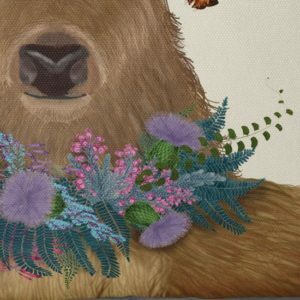 2 other sweater critters in this series. 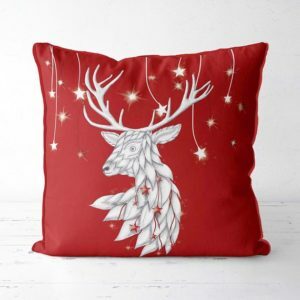 Taken from a hand drawn illustration of a deer with intricate line details, this stag head is perfect for Christmas and is on a deep red background, with red and white stars on ribbons shown hanging above him. 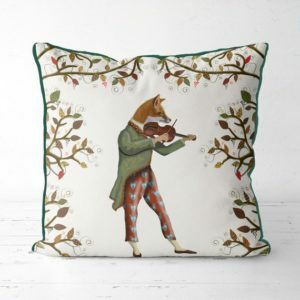 There are also stars and ribbons amongst his coat. 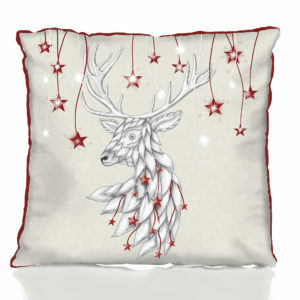 Taken from a hand drawn illustration of a deer with intricate line details, this stag head is perfect for Christmas and is on a cream background, with red and white stars on ribbons shown hanging above him. 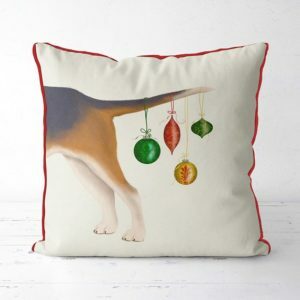 There are also stars and ribbons amongst his coat. 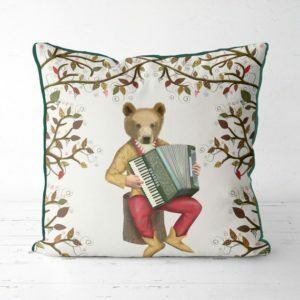 This Scandinavian style cushion cover is perfect for bringing a little Danish ‘Hygge’ into your home. 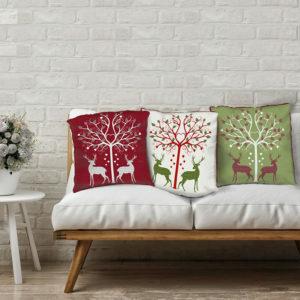 A great item for Christmas decor or year round, it actually comes in three different color combinations that are designed to match each other so that you can have a fabulous set. 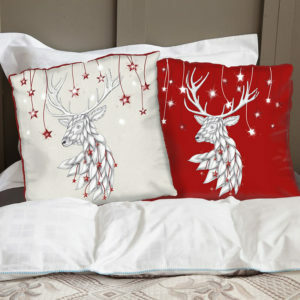 Printed on cream back and red piping all around. 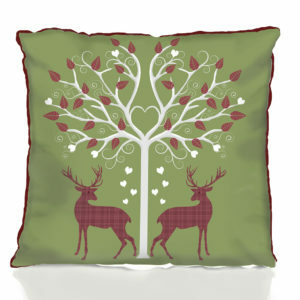 This Scandinavian style cushion cover is perfect for bringing a little Danish ‘Hygge’ into your home. 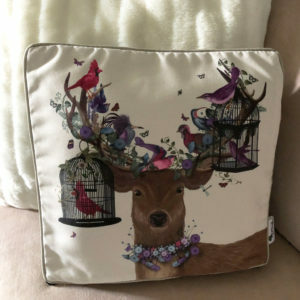 A great item for Christmas decor or year round, it actually comes in three different color combinations that are designed to match each other so that you can have a fabulous set. 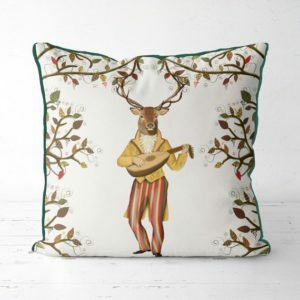 Printed on green back and red piping all around. 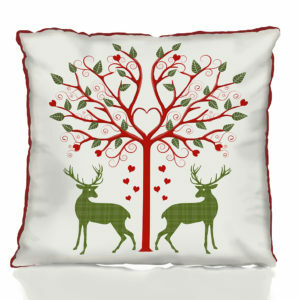 This Scandinavian style cushion cover is perfect for bringing a little Danish ‘Hygge’ into your home. 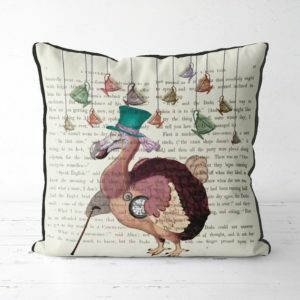 A great item for Christmas decor or year round, it actually comes in three different color combinations that are designed to match each other so that you can have a fabulous set. 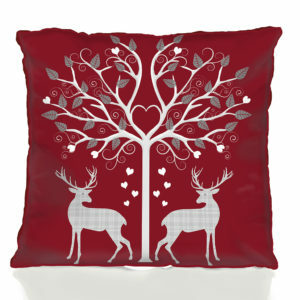 Printed on a red back and red piping all around.